Well, something had to give. The Bruins traded Aaron Ward for the 2010 4th-round pick and Patrick Eaves, who they immediately waived. 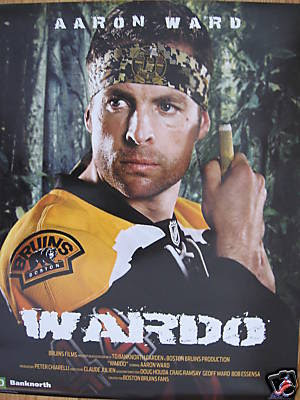 Aaron Ward will be missed in Boston, both on the blue line and on the air, as his weekly call-in to toucher and rich was usually quite funny. Of course, they could always go back to that Kessel for Kaberle trade with the Leafs. Assuming Chiarelli still has Burke on hold. I might be okay with that. I wish they would just sign Kessel or move him or something, waiting is the hardest part. 69 days until we see the first day roster take to the ice at the Garden. I have very strongly mixed feelings about this move. While it most likely means that the Bs will be annoucing a deal with Kessel probably no later than Monday it definitely weakens the defense. He was the most aggressive shot blocker on the team. Kessel better prove his worth this year. Very un-scientific viewing of people's opinion on Boychuk says there's a reason he plays in the AHL and not the NHL. Our defense will be a lot weaker now. Chiarelli apparently said he might be getting a defenseman now. Toronto has too many defensemen, but I don't want to see Kessel in blue and white. If Kessel does re-sign, I see him having a pretty good year with the Bruins. Wow, think it might be a little awkward when Ward and Walker make eye contact in the locker room for the first time in training camp? Or did the Hurricanes ditch knuckle draggin' Walker in the off-season? I agree with Cornelius the waiting is hard. The team is almost set for the season.